dealing with discomfort | What's in a Smile? You are currently browsing the category archive for the ‘dealing with discomfort’ category. Yesterday, I experienced an amazing Korean scrub and massage. It was awesome. However, there was a bit of braces-related trauma during the lovely massage, when I was massaged on my face and around my jaw and mouth. I must say that my deep pleasure was interrupted when the masseuse was powerfully rubbing in the lotion, especially right over my teeth. In the end, there was no real discomfort on my mouth, but I was a bit nervous. I’ve never had a facial, but I guess one of the pampering things that might be difficult to do with braces is anything that requires massaging strongs above the teeth. My boyfriend can tell when my lips are overly dry. “You look like you’re pretending to have collagen lips,” he says in a way that indicates that he doesn’t find this exactly Angelina Jolie-alluring. Drinking as much plain water as possible. I have been forgetting to do this. Drinking less caffeinated drinks. But I love my black tea with milk, I do. Eating healthy, even though I want lots of almond croissants. An article in the New York Times last month, A Lineman in My Bed: Notes on Teeth Grinding, talked about sleep bruxism, which refers to grinding or clenching teeth while asleep. I know I’ve had time when I grind my teeth. Had no idea I had a football player in my mouth! Here’s an earlier post on relaxing the jaw, with a couple of natural (non-drug) how to tips. I want to make sure to follow these because I suspect sleep bruxism has affected my bite — and hence brought me to my current state of wearing braces — and also I want to minimize the effect AFTER I get them off! I’m almost done! Actually, I have 3 months to go, but I’m 3/4 done! Woo-hoo! Rubber bands: I have to admit, I’ve been slacking a bit on wearing these during the day, but have worn them every night. So that’s at least 8 hours every day. Power chain: These were put on my bottom teeth. The first few days were very painful, but no problem afterwards. They have worked; the gap between my molars is closing. See photo. 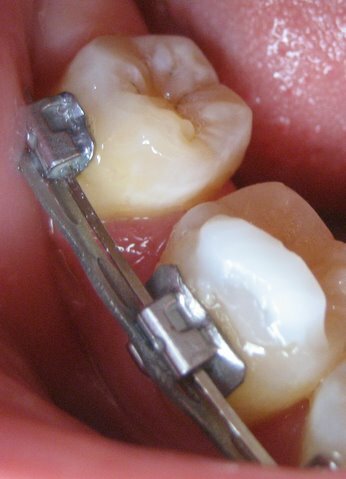 Wire wreaking havoc: The uncomfortable consequence of the molar moving forward is that the wire is sticking of the bracket about 1 mm in the back. And tearing up my cheek again. I’ve been suffering and trying to get some relief with wax. It’s kind of working. Will get that clipped at the ortho office tomorrow. Face shape: Over Thanksgiving, my brother-in-law noted how my face looks thinner because I have more of a jaw than is natural. I wonder how I will look when the braces come off? Will I look different to myself, or like my old self? What will people who met me in the last year, and only know me with braces, think? Food: Still looking forward to biting into something crunchy, and enjoying some lovely dried dates. A new gap has opened up; I think another power chain might be coming. Ouch! And look at the progress on closing the gap, compared to last time. On the topic of ways to deal with the pain of braces, here’s a post I wrote in my wellness blog about using mental imagery and visualization to deal with pain. The idea is to take attention away from the pain by putting attention on an image that is soothing or comforting in some way. For braces related pain, images that take you away from the area of your jaw and head could be helpful. Perhaps imagining your bare feet walking in the cool mossy floor of a quiet deep forest. Imagine how the coolness feels on the soles of your feet, and your toes. The smell of trees and plants. The feel of the soft breeze. Or maybe the coolness of water. Blue. Cool and soothing. Imagery and visualization can be deeply personal. Experiment. See if there’s a kind of image or visual journey that works for you. The super-tech arch wires that we usually get at the beginning of treatment — this was my case — are heat-sensitive. 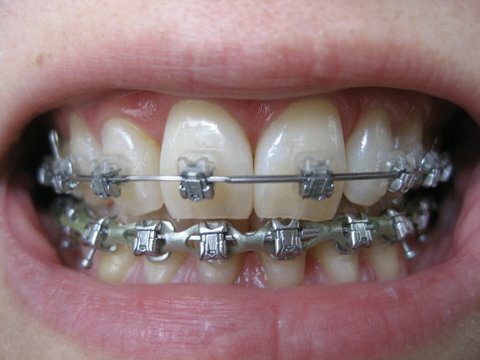 So when they are in our mouths and heating up to body-temperature, they exert more pressure on the brackets. And this is what moves our teeth. So, one way to give yourself relief, especially with new braces–albeit fleeting–is to put cool or cold liquid in your mouth. That will “relax” the wire. Of course, this only works with the heat-sensitive wires. So, give it a try. You don’t even have to drink the liquid. Ice cream or frozen yogurt would work, too. Just make sure it’s soft enough so you don’t have to chew it. I wrote about this recently, but I want to reiterate it. If you have a question or concern about your braces, or are overly uncomfortable, or notice something going on with your teeth/jaw/mouth/tongue that seems weird, CALL YOUR ORTHODONTIST. Don’t be shy. You are paying your doctor a LOT OF MONEY. It’s his or her job to answer your questions and make you comfortable. And don’t be put off if your doctor or the assistants or the admin people aren’t super-welcoming. (By the way, I’m not saying this based on my own experience; I just imagine it could happen to others.) As long as you have a legitimate reason to call to ask a question or go for an appointment, GO! YOU KNOW YOUR MOUTH BEST! I’m reminded of this because a reader wrote to ask me whether I have problems with biting through my elastics at night. I don’t since my elastics are short. She said she’d ask her orthodontist; I hope she got good support from her doc. Also I know now that many months ago if I had called my ortho when my mouth was being gouged out by a loose wire, I could have stopped the carnage and not suffered so much during a business trip. All I had to do was ASK. That reminds me, this includes when you are traveling. If you have problems with your braces while on the road, your doctor can find you an orthodontist where you are traveling. So don’t hesitate to call, even if you’re visiting Grandma across the country. The detailing by my doc at my last appointment has worked! I actually have a real bite now. Instead of my top teeth hitting the bottom ones. So now, I’m admiring my teeth not from the “health” perspective that was my initial motivation for getting braces, but from imagining how nice my teeth are going to look in a few months. It’s difficult to imagine through the dorkiness of all the metal and rubber bands, but this exercise let’s me see myself for what I am. In this society where a healthy smile is part of the national character, there’s a great deal of vanity about teeth. I didn’t know I’d get caught up in that. But I am. I do notice people’s teeth a lot more than pre-braces days. Mostly, I notice the positive — “Wow, what a great bite she has.” “Wow, look at that perfect bite.” I don’t recall noticing much pre-braces. The good news. Things are looking good. The way my orthodontist said that, it almost sounded like I might be able to finish up before 12 months. My rubber band wearing has paid off! I couldn’t help thinking of how great my car looked after it got detailed. That was before the doctor took pliers to my wire. Now, I think of detailing as personalized pain. 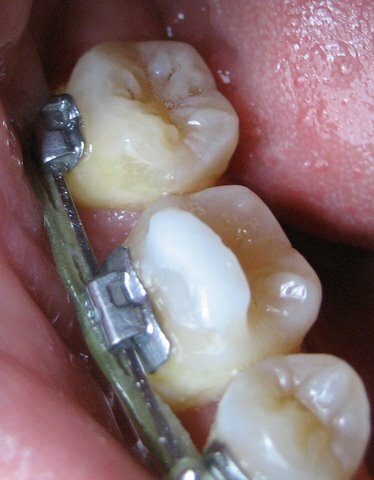 Whereas earlier, the arch wire asserted democratic pain–the same general push to move teeth to form a classic arch, regardless of your particular bite–detailing is a way to deal with your specific issues. My issue all along has been the upper incisors hitting the bottom one. The one that’s still a problem is the upper right central incisor (see post on names of teeth to see which that is) which hits the bottom tooth. So the doctor said he’d angle that tooth forward. He took out the arch wire and made two bends in the wire. More like twists; hardly looked like anything. But he put the wire back in and I could feel the pressure immediately. And now, 18 hours later, ow! Not as bad as when I first got the wires on, but definitely mushy food worthy. Last night, I had difficulty eating sushi. Motorcycle helmets SQUEEZE your head. I was reminded of this last night on a trip downtown and back. It was bad enough pre-braces, because the pressure is intense, especially with a new helmet. I don’t wear the helmet that much because only on occasion do I get on the back of the scooter with my boyfriend. 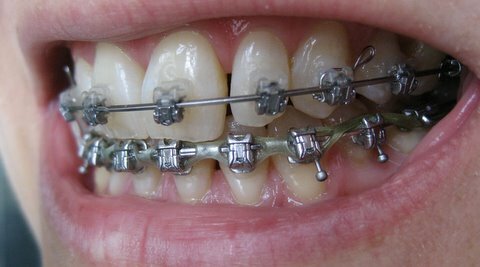 And even during the initial period of my braces it wasn’t a problem, because I didn’t have any brackets on the back (way back) molars. But now, I have brackets on three of the back molars — bottom two and upper right — the helmet is bad news on the top molar. My guess is this differs for everyone depending on their helmet and jaw structure, but for me, it’s very painful. I forgot to put on wax beforehand. So I made do by puffing out my cheek–which is difficult to do for an extended period–, sticking my tongue over the bracket for a while, and just breathing and being grateful that the ride wasn’t long.